Divorce brings so many challenges to couples and families. Unfortunately, the traditional approaches to getting divorced add to the difficulties. 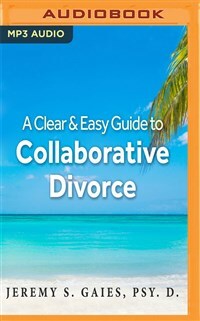 A Clear and Easy Guide to Collaborative Divorce describes a different approach, one that is more peaceful and more family friendly. This innovative method is now practiced throughout the US, Canada, and abroad. It is passionately supported by family law professionals wherever it is practiced because it allows couples to resolve disputes and reach a final agreement without fighting in court. It's simply a better option for many families as they navigate their path through divorce. In a simple question-and-answer format, this audiobook outlines how collaborative divorce works and how it might work for your family. This is a wonderful resource for any couple exploring divorce options. It is very comprehensive, packing a tremendous amount of helpful information into a succinct and easy-to-listen-to manual. Jeremy S. Gaies, Psy.D., is a peacemaker for families going through divorce. He is the author of A Clear and Easy Guide to Collaborative Divorce (2018) and a co-author of Mindful Co-parenting: A Child-Friendly Path through Divorce (2014). Dr. Gaies is also a co-founder of Tampa Bay Collaborative Trainers, traveling throughout the United States and abroad to teach professionals about the Collaborative Divorce process. He has practiced in Tampa, Florida, for over twenty-eight years.